Even though you make a chili powder here I promise this is a fast soup that is even a little fancy. The tart sweet pineapple “couples” well with the deep smoky chilies. It’s yummy and warm and comforting. The chilies are fairly mild so don’t worry that it will be too hot, unless you’re a real big wimp. We’re going to make our own ancho chili powder. Preheat a small frying pan over low-medium heat. Add the cumin seeds and ancho chili pieces and toast, stirring often, until fragrant and toasted, 3 to 5 minutes. Transfer to a spice grinder (I use a clean coffee grinder) or small food processor and grind to a coarse powder. Some bigger pieces of chili are okay. Add the coriander seeds to the cumin and anchos and pulse a few times to crush them, you don’t want them ground to a powder, just broken up pretty well. Preheat a big stock pot over medium heat. Saute the onions in the olive oil until transparent, 5 to 7 minutes. Add the serrano and garlic and cook for another minute. Add the spices and stir. Add the bay leaves, salt, lentils and 7 cups of water. Mix well. Bring up the heat, cover and bring to a boil. Once boiling lower heat to low-medium and let simmer for 1/2 an hour, stirring every now and again. Meanwhile, heat up your grill pan on high heat or preheat a broiler. Spray your grill pan with cooking spray and grill the pineapple slices for 4 minutes on each side, or until grill lines appear. If using a broiler, cook on one side for 3 minutes and the other for about 2, until pineapple begins to brown and slightly carmelize. Once the lentils are tender, add an extra cup of water/stock if you think it needs thinning. Add the lime juice and stir. Remove the bay leaf. Use an immersion blender to puree about half the soup. If you don’t have an immersion blender, use a potato masher to mash it up a bit, until desired thickness is achieved. Taste for salt. 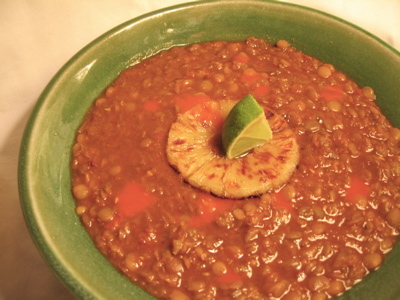 To serve: ladle into bowls and top with a pineapple ring, a slice of lime and dot with hot sauce. This soup is delicious, thank you for sharing. Clipboard save our all texts and documents even paste past in clipboard and you want to see your past documents for working again. so let i advised a website for all solutions & find clipboard history in windows 10. TestMy.net carries out a sequence of tests and generates a huge beneficial comparison data. One can even find the tests that were done in the recent times on this website.